Astronomers have discovered an exoplanet they’re describing as a “young Jupiter” and say it could serve as a decoder ring for understanding how planets in our solar system formed around the sun. 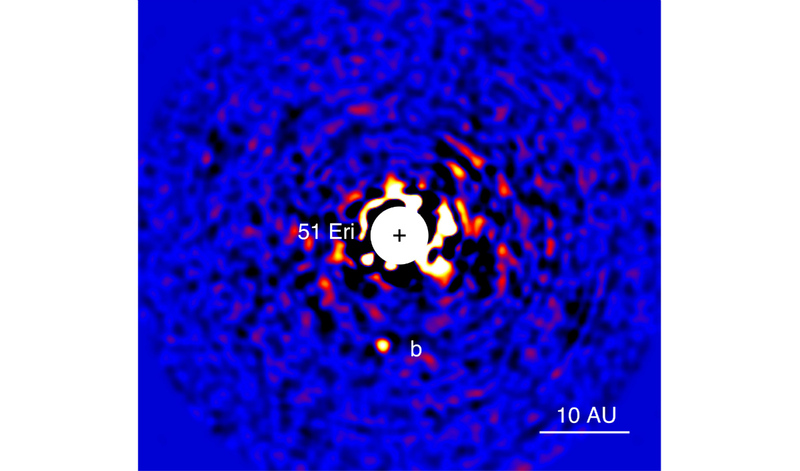 The team found the planet, named 51 Eridani b, using a new instrument called the Gemini Planet Imager (GPI). The exoplanet is the “faintest” one on record, and also shows the strongest methane signature ever detected on an alien planet. Metchev’s team conducted a study with data from NASA’s Wide-field Infrared Survey Explorer (WISE) to search for any thermal glow that such dust and ice can produce. 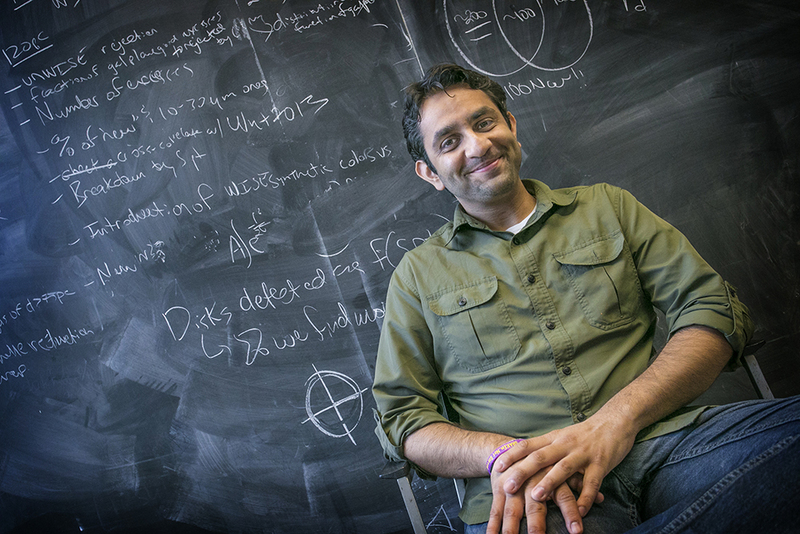 “We found that 51 Eridani is surrounded by warm dust that indicates the presence of an asteroid belt,” says Rahul I. Patel, a PhD student in Stony Brook who led the WISE study and whose previous work identifying recycled planetary dust, known as “debris disks,” around close to a hundred other star systems, puts the discovery of the exoplanet in context. The two belts—the asteroid and the cometary belt around 51 Eridani—fall on either side of the newly discovered planet 51 Eridani b. The GPI was designed specifically for discovering and analyzing faint, young planets orbiting bright stars. NASA’s Kepler mission indirectly discovers planets by the loss of starlight when a planet blocks a star. “To detect planets, Kepler sees their shadow; GPI sees their glow,” says Bruce Macintosh, a professor of physics in the Kavli Institute at Stanford University. The astronomers use adaptive optics to sharpen the image of a star, and then block out the starlight. Any remaining incoming light is then analyzed, the brightest spots indicating a possible planet. After GPI was installed on the 8-meter Gemini South Telescope in Chile, the team set out to look for planets orbiting young stars. To date, the astronomers have looked at nearly 100 stars. “51 Eridani is only 20 million years old, a little more massive than our sun—a perfect target,” says James Graham, a professor at UC Berkeley and Project Scientist for GPI. As far as the cosmic clock is concerned, 20 million years is young for a star, and this is exactly what made the direct detection of the planet possible, explains Macintosh. “When planets coalesce, material falling into the planet releases energy and heats it up. Over the next hundred millions years they radiate that energy away, mostly as infrared light,” says Macintosh. Once the astronomers zeroed in on the star, they blocked its light and spotted 51 Eridani b orbiting a little farther away from its parent star than Saturn does from the sun. Even though the light from the planet is very faint—nearly a million times fainter than its star—subsequent observations revealed that it is roughly twice the mass of Jupiter. Other directly imaged planets are five times the mass of Jupiter or more. In addition to being the faintest planet ever imaged, it’s also the coldest—400 Celsius (°C), whereas others are around 700 °C— and features the strongest atmospheric methane signal on record. Previous Jupiter-like exoplanets have shown only faint traces of methane, far different from the heavy methane atmospheres of the gas giants in our solar system. Of course, it’s not exactly like Jupiter. The planet is so young and still has a temperature of 400 °C, which is hot enough to melt lead. “In the atmospheres of the cold giant planets of our solar system carbon is found as methane, unlike most exoplanets where carbon has mostly been found in the form of carbon monoxide. Since the atmosphere of 51 Eridani is also methane rich, it signifies that this planet is well on its way to becoming a cousin of our own familiar Jupiter,” says Mark Marley, an astrophysicist at NASA’s Ames Research Center.